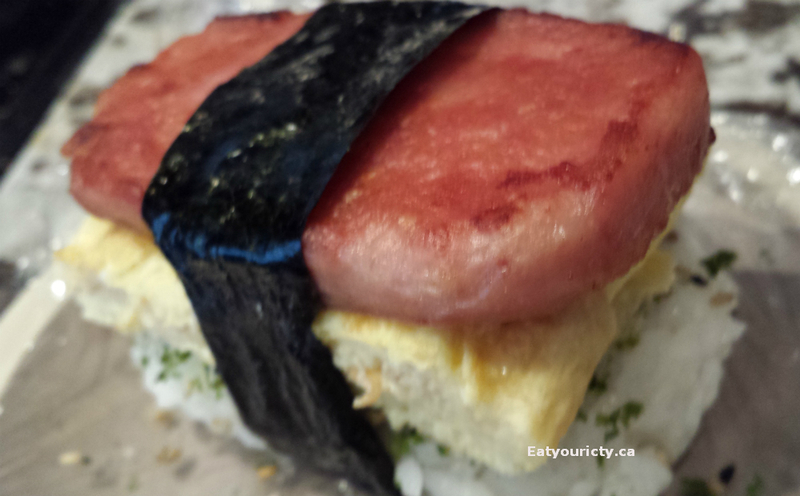 Eat Your City: Spam musubi recipe - American Hawaiian classic - with egg and without! Spam musubi recipe - American Hawaiian classic - with egg and without! Posted by I still remember the first time my Aunt from Hawaii visiting and hunting out a can of spam so she could have it for breakfast. The glistening pale pink blob that came out of the can resembled more of a hideous Hollywood monster brain goop than food. 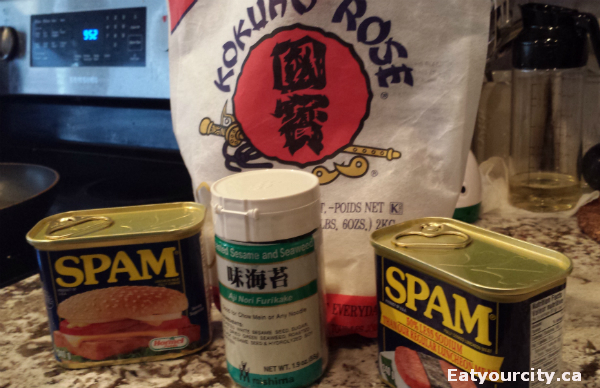 But Spam is long in its history and whether you love it or hate it, its rendition into Spam musubi on the Hawaiian islands is a traditional delicious (if incredibly unhealthy) snack or breakfast. 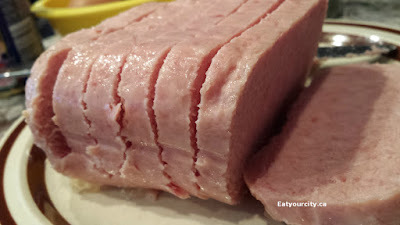 Spam - a "spiced" tinned ham that really doesn't have any spice other than salt and nitrate, wove itself into American history as it was eaten as protein during WWII by the military and American families alike. It's ingenious in its making as there's so much fat blended in, you can pan fry it up without oil, eat it straight from the can, or cut it thin and fry it into bacon like strips that is missing the smoke. Plus, it was cheap and it had long shelf life in transportable tins which made it ideal for the military. Its so popular in Hawaii, its been dubbed the "Hawaiian Steak", and in Oregon, they even have a Spam parade! So, back to the story about my aunt. She got me to try some pan fried spam with eggs, which tasted like a super salty bacon with eggs, so I wasn't sure why she was craving it so much. Fast forward about 10 years when I went to Hawaii a few years back and tried spam musubi - a pad of sushi rice, a dash of Nori Furikake or roasted nori and toasted sesame with a slab of seared spam on top and wrapped with nori to secure the package in place... and I finally understood. I got it. So. damn. tasty!!! The combination of rice to offset the rich salty spam and unami notes from the nori were fantastic! We made sure to pop into a grocery store, restaurant or the ubiquitous ABC stores in the morning to grab one for breakfast every single time we've travelled back to Hawaii since. And since we can't go jaunting back to Hawaii whenever we get a craving, here's a recipe for these tasty and filling packages of awesome. 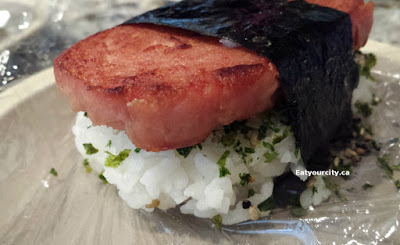 I think I'll invest in a musubi shaper as I used my hands to shape the rice in the pics I posted.. a musubi mold or press is the way to go if you love this strangely addictive and yummy spam musubi! I've used both low sodium and regular Spam, and found while the taste is simular, the low sodium version burns a lot easier and faster than the regular Spam, so if you like to really slow cook your Spam to a nice crispiness, go with the regular stuff or the low sodium stuff will just leave you with blacked strips. 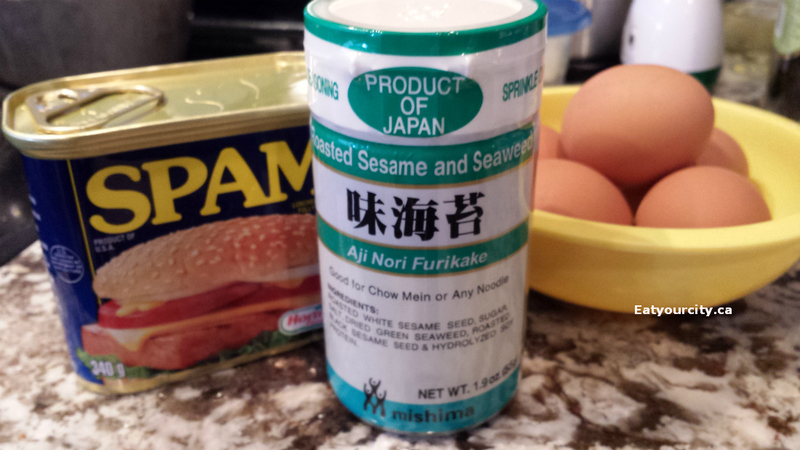 4) Top rice brick with a sprinkle of Nori Furikake, then top with optional egg and browned Spam slice. Wrap with nori strip and fold up the plastic wrap to keep everything in place. Dig in! LEGO gummy candies - tips, trick and video!